PORTLAND, Ore.--(BUSINESS WIRE)--After connecting with conference goers at the exhibition hall, educating with live demos, and Founder, Sce Pike, inspiring on the Growth panel, IOTAS was awarded the Startup of the Year 2019 title by Startup Grind. “Of the thousands of startups we consider and speak with each year, IOTAS showed what it takes to take the torch and we are thrilled they are 2019's winner,” said Derek Andersen, Founder + CEO at Startup Grind. What does this look like for IOTAS? Currently they are fund-raising and seeking strong sales people in NY and LA as well as Java developers to join their team. 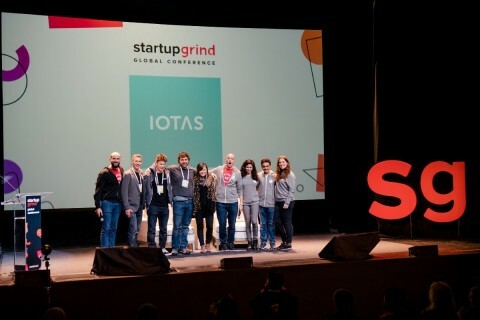 “IOTAS is honored to win Startup of the Year from Startup Grind. It was an amazing event with the most impressive lineup of speakers I’ve ever seen. And the caliber of the startup companies in the Growth stage was incredibly high. Startup Grind definitely filled a void for startups like us who are on their way to growth stage and gave us a great platform to meet with investors, other startup founders, and partners,” said Sce Pike, CEO, IOTAS. Stay tuned for an article on IOTAS’ startup journey, and look for the team at CRE Tech, NAA Apartmentalize, Connect, NMHC, Women of Influence, BISNOW, Disrupt CRE, and already looking forward to presenting at Global 2020, the 10-Year Anniversary of Startup Grind. IOTAS is a PropTech company with a Smart Apartment platform for the $500B Multi-Family-Home industry using AI & Machine-Learning. IOTAS provides an IoT solution that enables properties to attract more residents at higher rent premiums while reducing costs of operations. Their install base has grown 490% in 2018 to be in thousands of units and they are managing 100,000s of smart devices in over 70 communities. IOTAS has been recognized by Fortune, Wired, ABC, NBC, FastCo and more as the new way of building and renovating residential real estate. IOTAS is funded by OVF, 1843, Scrum, Rogue, PSF and Intel.